On Wednesday, March 14th from 5:30-7:30pm I will be hosting my first Women for Gretchen event, and I wanted to reach out to invite you to join us! This is your chance to support an exceptionally qualified candidate and woman as YOUR NEXT STATE SENATOR here in Maryland! The Maryland State Senate seat in District 42 is open in 2018. 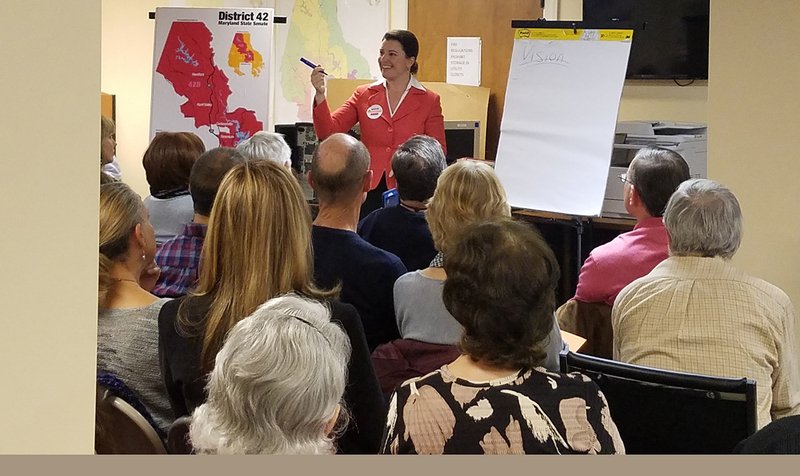 Encompassing much of Baltimore County, District 42 is a swing seat that is vital to keeping a Democratic veto-proof majority while we have a Republican Governor. We need to fight to keep the seat and I am the Dem’s ticket to winning this race! I grew up in District 42 and I have worked as a Neighborhood Planner for over 20 years. I have a background in mediation, and I know how to put People Before Politics and Bring Resources Home to our communities! I have fought for and won money for our schools, and funding to protect the Chesapeake Bay and preserve our open spaces. I’ve helped ensure that we all have access to affordable health care, and I’ve worked to make our neighborhoods safe. I’ve supported our small and local businesses, and job opportunities for our young people. Check out my new campaign video, and Friend me on Facebook to see what I’ve been up to in our communities! I am a woman, a mother, a daughter, a sister- this is key in 2018 elections, and especially in District 42 where women make up 60% of registered Dem voters. I’ve knocked on several thousand doors and met with hundreds of community groups and local businesses since the start of my campaign- I am well on my way to winning the June 26th Primary- but I need your help!